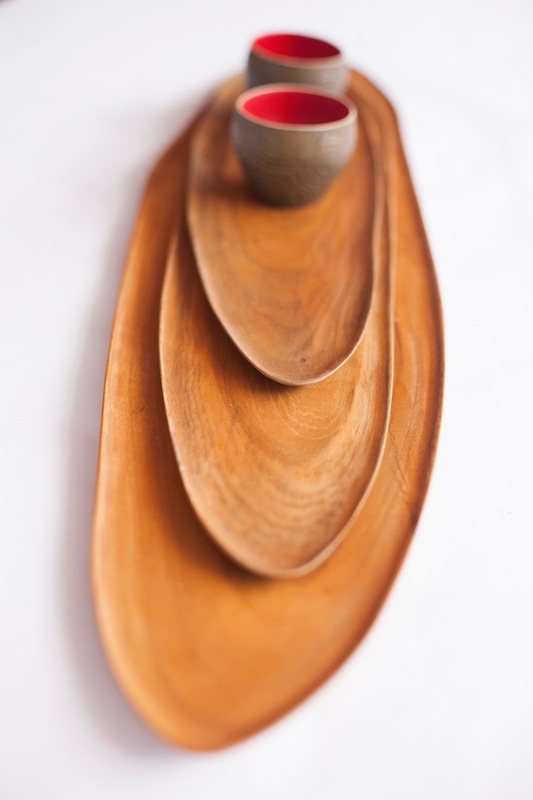 Deya's wood products are all handcrafted by our skilful artisans in Solo, Central Java. We concern ourselves with finding the beauty in the grains,knots and holes of the wood - characteristics that could be easily dismissed as imperfections. A variety of hardwood such as Pterocarpus Indicus, Teak, Longan and Campaka are used to create Deya's unique products. Teak is sourced from teak plantations and inactive woods. Deya also utilises residual scrap woods that are manufactured in-house in Solo, Bali and Jakarta. Deya's wooden leaf boxes are made from longan and teak wood. They are coated with shellac, to heighten the grains of the wood. This multi-function bowls are suitable for your snacks at home, or even for your knick-knacks. For more variations, we provide you two kinds of woods; teak and longan. Each of them has different properties and textures. Size varies. Size ranges from W15 x L10 cm to W25 x L30 cm. This leaf bowl design is a combination of teak wood and a porcelain bowl. This bowl is designed to store any item of your choice, be it for snacks or knick-knacks. The teak wooden leaf of the lid is carefully handcrafted by the hands of Deya's skilful artisans in Central Java, whereas the porcelain bowl is made in Jakarta. Deya's leaf collection is for decorative purposes for your table setting at home. Each of the items in this collection is never identical - each varies in size and shape as they are handcrafted by Deya's artisans. Deya has produced these leafs in two different woods; teak and longan. Each has different characteristics and color. Each of the wooden leaf is thin and delicate, and the beautiful forms will definitely layer your setting at home. The rounded wooden tray is suitable for any chips and dips snacks, to make your eating experience convenient. 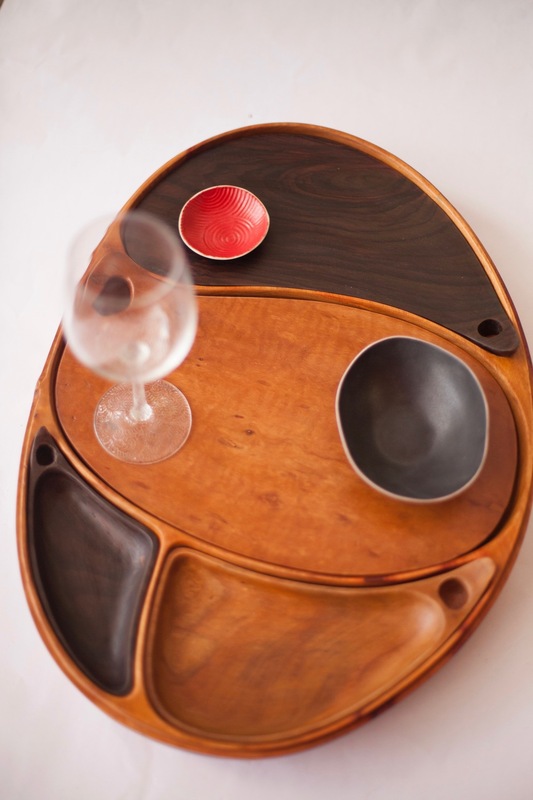 The rounded wooden trays are a good match with Deya's batik-applied bowls and dishes. Deya's serving tray comes in two sizes: size M and size L. This tray is a very simple design which complements really well with the vibrant colours of Deya's tableware. This triangular set tray comes in three. Suitable to place any item of your choice e.g. food and bowls. This flat tray set heightens the contours of the wood grains. These rear pieces bring harmony and elegance to your home. Available in both teak wood and Indian Rosewood. Each set/ wood is varied in size. This rectangular tray set is an edgy centrepiece for your home. Please note that the number of set varies. Deya's wooden platter is suitable for cold cuts and cheese. The beautiful longan wood is a good fit to accentuate your culinary experience at home. This design comprises removable parts, to serve as trays and cutting base, and to also be able to be cleaned without any hassle. Deya provides you with a range of serving spoons, soup spoons, rice spoons and ladles. This range is made of longan wood with reddish-brown in colour. Each design is produced in different sizes, as they are handcrafted by our artisans. Deya's tissue boxes are available in different forms. The use of teak and longan wood fits its property of durability. The simple designs of this range could harmoniously fit in any home.